Lyrics to the song My Only Love as recorded by Roxy Music. 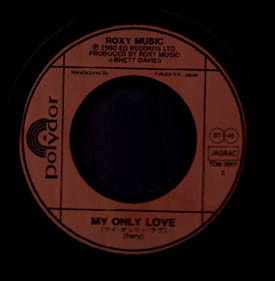 This song from Roxy Music's Flesh And Blood album was used as the b-side to the Japanese pressing of the Same Old Scene single. It has been performed on the Flesh + Blood (1980), Avalon (1982) tours, the reunion tour in 2001 as well as the Bryan Ferry Frantic tour and the Roxy Music shows in 2003, 2005 & 2006. Live versions appear on The High Road, Heart Still Beating and Roxy Music Live.